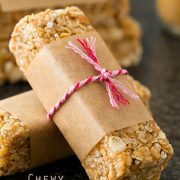 This Homemade Peanut Butter Granola uses just 4 ingredients and is ready in under 30 minutes. It’s super crunchy and packed with peanut butter flavor. 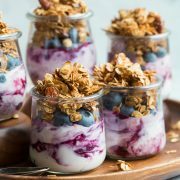 Enjoy atop yogurt, smoothie bowls, and more! 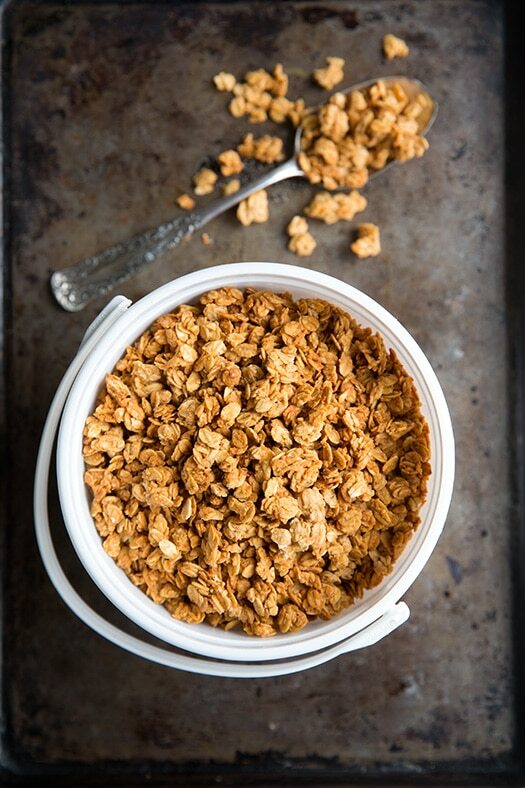 Are you ready for the easiest granola recipe of your life? Seriously, I don’t know if granola gets any easier than this! This is not only the easiest granola I’ve ever made, but it also baked faster than any granola I’ve made. I made a few batches of this peanut butter granola trying to get the recipe just right. I tried to do a 3-ingredient homemade granola on the first attempt. While it was good, with the lack of brown sugar it just didn’t have enough crunch. So, on attempt two I added in brown sugar and not only did it give it a little crunch, but it also added a nice flavor too. 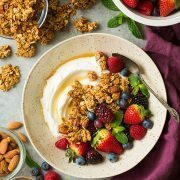 This is a healthy and kid-friendly granola recipe and is one the whole family can enjoy. With how easy it is to make and the fact that it uses basic pantry staples that you likely always have, this might just become a regular in your home. Serve it with almond milk or Greek yogurt and some fresh fruit and you’ve got a breakfast worth waking up for. Enjoy! Preheat oven to 325 degrees F. Pour oats into a mixing bowl, set aside. In a microwave-safe mixing bowl, combine peanut butter, honey and brown sugar and heat mixture in microwave until runny and smooth, about 25 seconds. Pour mixture over oats in mixing bowl and toss mixture with a spatula until evenly coated. Spread mixture onto a Silpat or parchment paper-lined baking sheet into an even layer and bake in preheated oven until golden brown, about 18 – 20 minutes, stirring once halfway through baking. No, only old fashioned oats will work in this peanut butter granola recipe. Instant or steel cut oats would result in a different texture and may not cook properly in the oven. Keep this homemade peanut butter granola in an airtight container on your counter. It will keep for up to a week this way. 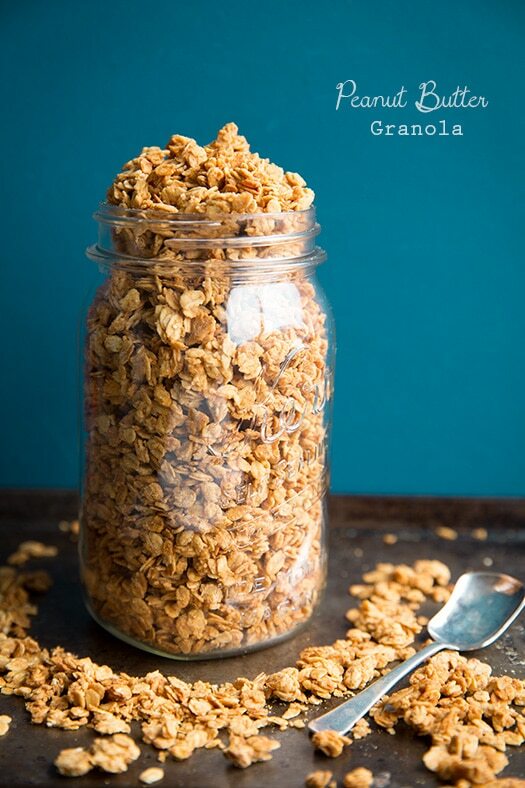 You can also freeze granola in a freezer baggie for up to 3 months. Just let the granola rest on your countertop for 10 minutes before eating it. If you want one more layer of flavor, you can add 1/2 tsp of cinnamon, but personally I don’t think it needs it. Let the granola cool completely before eating it. It crisps up as it cools! Make sure to stir the granola halfway through the baking time, otherwise it might not bake evenly. 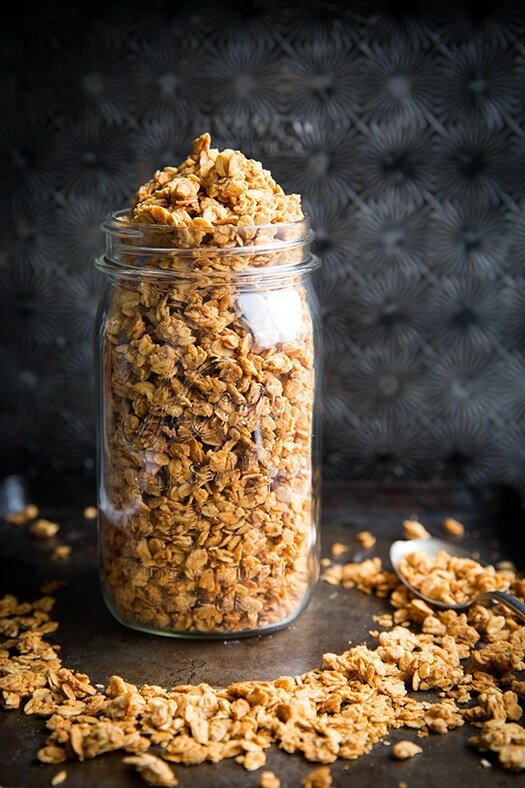 This Homemade Peanut Butter Granola uses just 4 ingredients and is ready in under 30 minutes. It's super crunchy and packed with peanut butter flavor. In a microwave-safe mixing bowl (or it can also be melted in a saucepan), combine peanut butter, honey and brown sugar and heat mixture in microwave until runny and smooth, about 25 seconds. Pour mixture over oats in mixing bowl and toss mixture with a spatula until evenly coated. Spread mixture onto a Silpat or parchment paper-lined baking sheet into an even layer and bake in preheated oven until golden brown, about 18 - 20 minutes, stirring once halfway through baking. Allow to cool completely (it won't be crunchy until it cools) and store in an airtight container. If you want one more layer of flavor, you can add 1/2 tsp of cinnamon.